... something doesn't feel right. My guts are telling me that there's a storm coming and my guts are almost always right. Sorry to interrupt Cysero but I'm an important person and I have something to say. I am Chairman Platinum, CEO of EBILCORP, the new owner of AdventureQuest Worlds... or should I say EBILQuest Worlds. The face of your new leader. Get used to it. 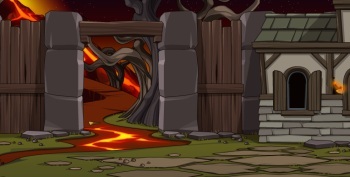 EBILCORP has acquired EBILQuest Worlds and the former Artix Entertainment "Secret" Underground Lab in a very hostile take over. I'm pleased to announce that the days of argument over non-member versus Member are over. The game's new center will be on profit at the expense of you, the little guy. All you new minions will be treated equally and you can expect to be charged more money for less game. We don't have time to do weekly releases so releases will be moved to a yearly schedule. This is only the first phase of my master plan to infiltrate your lives, take what I want and leave you in the dust. The best part is that it's already happened, and there's nothing you Cysero, Alina or even Artix can do about it. Enjoy EBILQuest Worlds, Phase I and Happy EBIL Fools Day.... you fools! Mount up, Hero! It's ZARD-riding time! 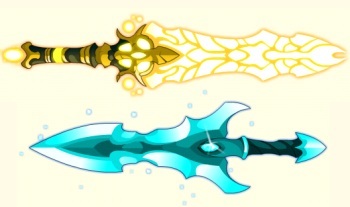 Battle your way to /battleon RIGHT NOW for the first Limited Quantity Shop of 2012! 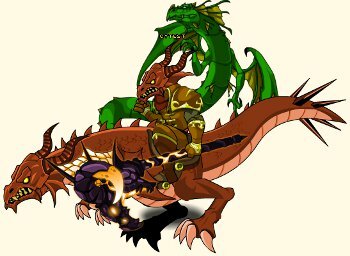 Khuddar has epically awesome armors and items this time around, including the Zard Rider and Dragon Rider Armors, as well as the Dragon on your Back Cape! Quantities are limited, so get your gear while it's still here! First things first: Zard Riders /dance2 conga line. Go! 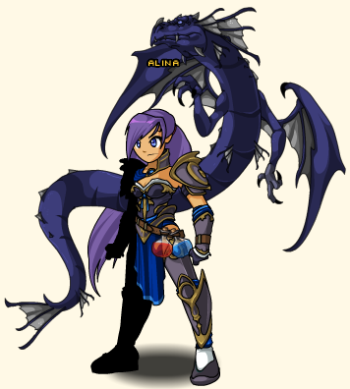 We have opened up a Limited Quantity Shop in Battleon. The items listed below will all be in the shop with the stated prices and quantities. Tame a dragon... or ride one! Get ready to /spar while riding a dragon. Epic! MUCH better than a monkey on your back! 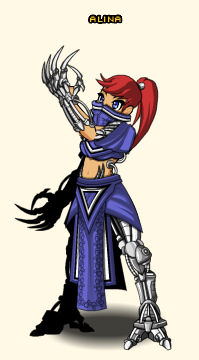 Members can utilize cyborg power in Solrac's Legacy armor! 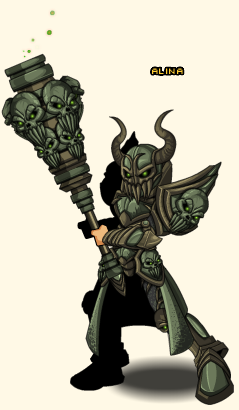 Toxica Armor, Horns, and Smasher! And once you're done browsing Khuddar's shop, make sure to /join poisonforest to play the latest release! 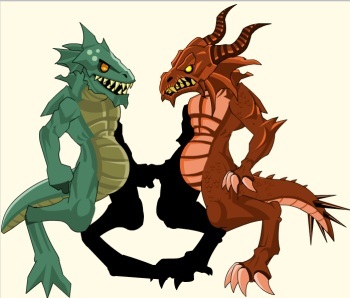 As we said on artix.com, this weekend you'll see that Good and Evil aren't always what they seem to be! The question is: what are YOU willing to sacrifice to save a life? Lions and poisons and burning, oh my! Members of the Alliance rally and two NPCs decide to battle side by side for the rest of their lives! 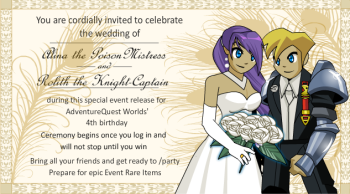 Play through the storyline to get your very own invitation to attend the in-game wedding of Rolith and Alina on AQW's fourth birthday on October 12, 2012! 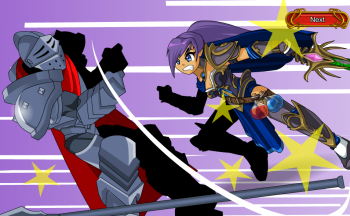 Battle your way to /battleon this Saturday at 10AM EST (server time) for the first Limited Quantity Shop of 2012! 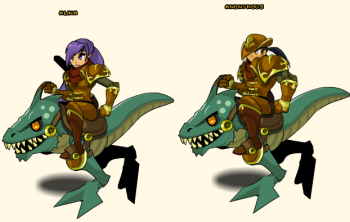 Khuddar has epically awesome armors and items this time around, including the Zard Rider and Dragon Rider Armors, as well as the Dragon on your Back Cape! Quantities are limited, so get your gear while it's still here! At 10 AM server time on Saturday, March 31st (that's THIS Saturday! 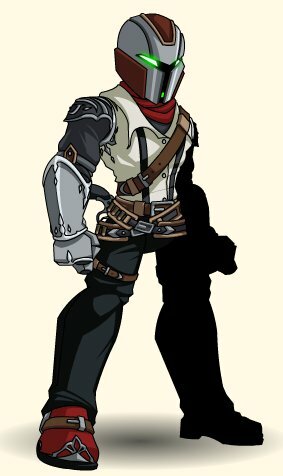 ), we will open up a Limited Quantity Shop in Battleon. The items listed below will all be in the shop with the stated prices and quantities. As I mentioned in yesterday's Design Notes, I have said before that I doubted that we would ever have time to create a class for the Mid-Week Mini-releases as they take a lot of resources and time and the Mid-Weeks roll out with a skeleton of 3 to 4 people, depending on the week. BUT so many loyal AQW Members were asking for it that we decided to try and make it happen for you guys and it looks like we did. The Blood Ancient Class is the focus of this week's Mid-Week MEMBER ONLY release! 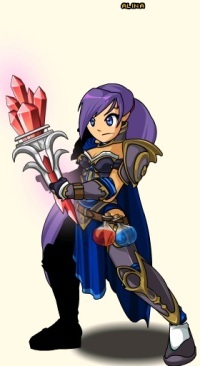 NOTE: You will need to do the Darkovia storyline quests until you reach Safiria's castle to complete this Mid-Week Release. Orlok is Queen Safiria's Vampire Loremaster. One of his primary functions is to uncover ancient secrets of the vampire race (yes, they are a race thanks to the transformations brought on by the vampire magi-virus). This week Orlok needs your help to uncover the secrets of an ancient ritual that was said to be able to give all the powers of a vampire to ANY creature but spare them any of the weaknesses. And let's face it, Vampires are pretty weak. They can be hurt or killed by sunlight, crosses, wood, silver, fire, magic, beheading, holy water, and garlic... they can't cross running water, can't fix their hair in a mirror, can't even enter a house without being invited. My 2 year old son can walk into someone's house without being invited (and often does). Frankly, it's amazing that this Darwinian failure of a race has made it this far. BUT, there are definite advantages. Immortality, being one step up on the food chain, improved strength and speed, very enviable mental powers, shape shifting powers, a certain undeniable appeal to the ladies and in some rare instances the ability to sparkle (Which I do consider a plus. Sparkles are pretty). One very clever vampire mage imagined just that and the idea of the Blood Ancient was born. Sadly the ritual was lost without ever being tested. Now Orlok has gathered stories and rumors and followed the trail to Safiria's own castle. If you are able to complete all of his tasks, you will become the first BLOOD ANCIENT! Now let's talk about the class. This class is a warrior based soloing machine based on a vampire theme. As it is Warrior based, I suggest FIGHTER Enhancements. I haven't tried a lucky CRIT build but maybe you'll want to. Mana should not be a problem for you which might, in itself, be a problem when you unlock the Regeneration Skill. This class is very straightforward. It is designed to be a solo class, with good survivability and a LOT of damage potential but no AoEs at all so not the best for farming. Does moderate damage applies the and both weakens and slows your opponent for 4 seconds. This class starts with a very decent attack. It says Moderate damage but you'll feel strong just using this one power, plus it also slows your target AND reduces their damage. It's a little expensive but balances with the cooldown and mana regen so it's not bad. Causes a moderate open wound on your foe. Smelling their blood increases your STRENGTH and SPEED for 6 seconds. Once you draw blood, your new vampire senses kick in increasing your strength stat and your haste. So this skill not only does MORE base damage than the previous skill but also buffs your damage potential. An even stronger attack then the first one with the additional bonus of a very healthy buff for you. Steals some of your opponents life and causes you to heal over time. The less mana you have the stronger the Heal Over Time is. Classic camp stuff going on here. a weak attack that also heals you over time. It's a pretty beefy heal and you can keep it going most of the time but here's where the mana regen comes in. The HoT (heal over time) gets STRONGER the less mana you have but it's really pretty easy to keep your mana up in this class so you have to time it against when you need the heal and when it will be the biggest heal possible. No real reason not to spam this skill as soon as it comes up, but to use it WELL takes skill. Very fitting passives here. As you master the class you get stronger and faster... like ya do, you know, when you're a child of the night. Causes HIGH damage and stuns your opponent for 1 to 10 seconds! Here's an interesting one. A High Damage power, which is great, but it also stuns every time. The only drawback is that it could stun for 1 second, or could stun for 10. The chances of getting a long stun are slim and the chances of a short one are great but a stun is a stun. This one is a mana pig so it's a good idea to use this before using Regen to get the most out of the heal. Rarely, your body takes the form of a hazy fog which reduced the amount of damage that you take to nearly 0 for 10 seconds! Some vampires can take the form of mist or fog and you are apparently one of them. Sometimes, your form will take on the aspect of mist. It will not appear different but swords and arrows will pass right through you doing little or no damage for a full 10 seconds. You can see with the solo damage abilities, self-buff, targeted debuff, self HoT and rank 10 passive which increases survivability that this class we designed to take on stronger foes with a lot more HP than most players can handle. It will take a little farming to buy it from Orlok's Merge Shop once you complete his quests but far less than getting a reputation to Rank 10, or you can always take the easy path and buy it off Itzachi for ACs. But considering that it only takes a little patience and hard work I would save the ACs for this Saturday's LQS. Hope you guys like it and happy Mid-Week! Artix and Sepulchure Collectible Action Figure Toys Coming Soon! You can get Artix and/or Sepulchure! Each figures comes with their own weapon. There are rare BLACK variants of each toy (which look pretty awesome). These will be available in Toys R Us in the United States and on HeroMart shortly after that. I'm sad to say that I STILL have no fixed release date for you, but I keep getting told "Late April, Early May". Vampires are a VERY old race on Lore and with society full of immortals they don't really have much need of records. If you want to learn a spell that was created 2000 years ago, just go talk to the guy who made it. But accidents, battles and wars can claim the unlives of even the most powerful vampires. Powerful secrets of vampire lore are lost get lost in the pages of history. That is where Orlok comes in. Orlok is Queen Safiria's Vampire Loremaster and his job is to search what records there are and use his keen intellect to rediscover lost vampire secrets. Recently he has come upon one such secret and if you help him complete his research you might become Lore's first BLOOD ANCIENT! Tomorrow, the Mid-week will take place in the Safiria map, where you will find Orlok standing outside Safiria's castle. Complete his tasks to unlock a single farming quest which will allow you to purchase the first Mid-week CLASS, the vampire based Blood Ancient! Blood Ancient Class, armor and helms designed by Solrac. I will be doing another Design Notes tomorrow with the skills breakdown but I will tell you that it is warrior based, good for solo-ing and PvP and, like all Mid-Week Releases, MEMBER ONLY! Earning the class will NOT require any reputation. 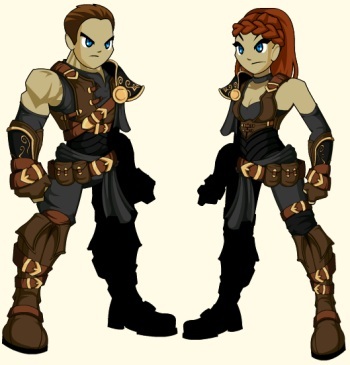 All you have to do is complete the Mid-Week quests and farm for the merge items necessary to buy the class (and either or both of the helm hairstyles shown above). It will take some time to earn it but far less time than grinding a Reputation to Rank 10. 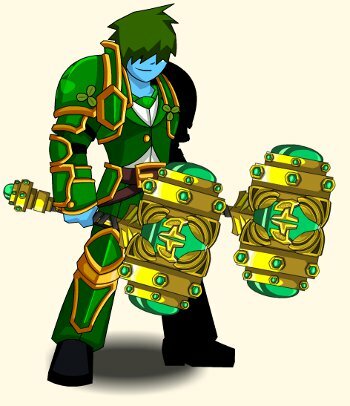 For those of you who don't have the time for the Mid-Weeks and don't want to wait until the weekend to put in the time to earn it, a 2000 AC version will be available from Itzachi (class only, no helms). The 2000 AC version will ALSO be MEMBER ONLY. This class is part of a mid-week release and mid-week releases are intended to be Member Perks. Both versions of Blood Ancient as well as the both helms will be tagged as AC items so you can store them all for free. I know that I said over Twitter time and time again that we would probably never have time to do a class in a mid-week considering the time and effort that it takes to create one and the skeleton crew that contribute to the mid-weeks, but considering how many of you have asked and that everyone who asked MUST all be Members, it became a priority for me to try and make it happen. Come back tomorrow for the Skills Breakdown! 10:00 AM Server Time on Saturday. The die has spoken. Be there or don't. I know that is a mouth full but some people don't know what Action Figures are. Just calling them toys doesn't do them justice considering the quality with which they seem to be made and the fact that they are in-game swag pinatas. 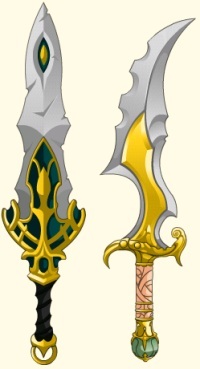 You can get Artix and/or Sepulchure! Each figures comes with their own weapon. There are rare BLACK variants of each toy (which look pretty awesome. The final I CAN HAS MOD contest is coming to a close and the drawing will be held on Friday. Then, as usual, we will contact the winner through the e-mail that the character has provided to us. Remember that if you don't check your e-mail then you can't win. Also remember that for every month of Membership you get one extra chance to win and with the new class coming it might be the right time to Upgrade (shameless plug). You can also get one extra entry for every AEXtra that you complete on the AEXtras offers page. See you guys tomorrow for the Mid-Week mini-release and the skills breakdown. Sarah Prineas’ The Magic Thief characters guest star! Join us for a fantastical AQWorlds in-game special event with magical literary guest-star, Sarah Prineas. Meet magicians, thieves, nobility, and misery-monsters as her characters cause Chaos! The ley lines which contain Lore’s magic are vulnerable to infection by Chaos. 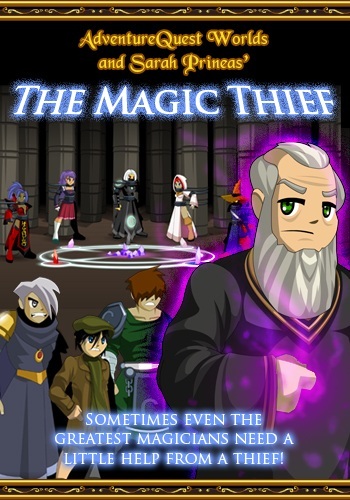 When Drakath uses the nefarious wizard, Pettivox, to infect them, it will be up to you and Conn – a pickpocket turned mage – to save all of the magic (and mages) on Lore! 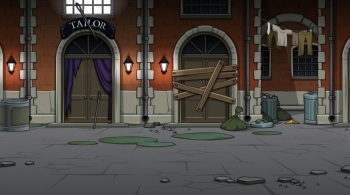 Log into AQWorlds on March 23rd 2012, at sundown for the most magically, massively, manipulative event yet! AQWorlds' first guest author event! On behalf of the entire AQWorlds team, we want to thank Sarah Prineas for being a part of this special event! She has generously spent her time and energy helping to make our first guest author event so monumentally magical! If you’ve enjoyed meeting Conn and the rest of the cast of characters that live in Wellmet, we recommend you check out her Young Adult novels! Fun for readers of all ages, the fantastical world she’s created will put you in Conn’s place as you adventure in a land of magic, mystery, and massive mayhem! Explore the land and people of Wellmet on her publisher’s website! Buy your own copy of The Magic Thief and let the adventure begin! Visit Sarah Prineas’ website to see more of her current and upcoming work! You'll have TWO separate shops - an event rares shop and a permanent event rewards shop - quest rewards and monster drops! Be sure to check all of the shops for the gear you're searching for and if it's not there, get to battling! Good luck during the event! May the fates favor your swords and spells when you confront Pettivox to save magic from Chaos! The future of Lore’s magic rests in your hands, Hero! Exploring a world's backstory - its history, lore, and all of the little details which flesh out a land - makes a game richer and allows you to immerse yourself in your character. We don't always have enough time to do that in AQW, which is why I'm so excited about getting to share some of these details with you! With that said, let the next magic lesson* begin! 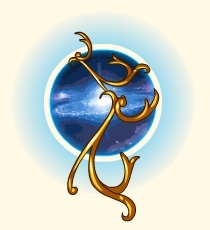 Nexuses, formed where two or more ley lines cross, do not only act as reservoirs of magic on Lore; they can also be portals to the para-elemental plane of magic. On rare occasions, mages can directly transport themselves to the plane through the manipulation of these portals. You may have encountered one of these portals in-game already. If you're a mage and you haven't, then you haven't been paying close enough attention to the pull of your focus stone. *** Legend has it that if a mages looks inside themself and follows the pull of their stone, they will be led towards the nearest nexus. In that respect, it is both focus stone and lodestone. Fade Tome and Staff Armaments! While ley lines are fine for everyday magical needs, if the spell you are attempting requires massive amounts of magic, it would be wise to situate yourself near a nexus. The availability of extra power could mean the difference between life and death. IF you're strong enough to channel it all! 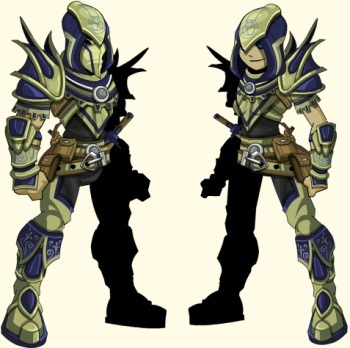 Mana Thief Armor - available in the Event AC Rares shop! 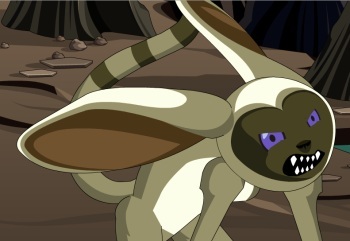 ** The Embero Spell transforms a Hero into the form of the creature they most resemble inside! *** More on focus stones tomorrow! There are many monsters in the world of Sarah Prineas' The Magic Thief, but I was most intrigued by the idea of the misery eels. A monster that is attracted to pain and suffering has so much potential, and allows for so many opportunities to completely upset and overturn expectations! In the event, Cysero studies the misery eels and, as you can see above, one young eel decides to study HIM in turn! *** Everybody needs a biscuit to wind a piece of string around. Action Figures On the Way! 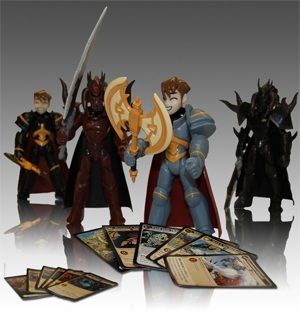 We are SO excited about introducing the first-ever Artix Entertainment action figures! They are coming soon and we don't have an exact date for their Heromart and Toys R Us releases yet, but we could not wait to show you how AWESOME they are! Artix and Sepulchure action figures! There will ALSO be a limited number of variant figures in Black versions of the armor. Pay attention to these, because DoomWood: Part 2 "Reforging the Blinding Light of Destiny" is starting soon. They will exclusively be available at HeroMart for our craziest players. Have a great night and don't forget to check out the event page for The Magic Thief: Chaos in Your Veins! Magic Thief Event This Friday! Chaos in Your Veins... and in Lore's Magic! * Check out her website here! 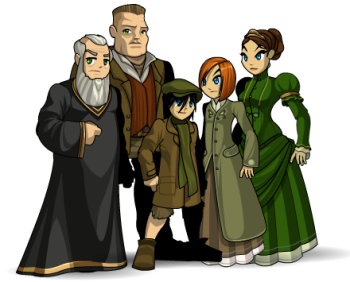 Join Conn, Rowan, and the rest of The Magic Thief cast along with Cysero and Warlic as you journey to a new land to save the lifeblood of your home - Lore's magic! Rescue the missing mages and sever Pettivox's connection to the magic of Lore... or NO one will be able to use ANY magic again without being tainted by Chaos! We are incredibly excited that she has allowed us to tell a whole new story set in Lore with the characters and land that so many of her fantasy-fanatical fans know and love! We've been in talks about this event since November, and work began in earnest this past January. Since then, I've read and re-read The Magic Thief in preparation for the event, and can't wait to begin the next books in the series! No mage is safe from Pettivox and Drakath's plotting! home to many of Wellmet's citizens. 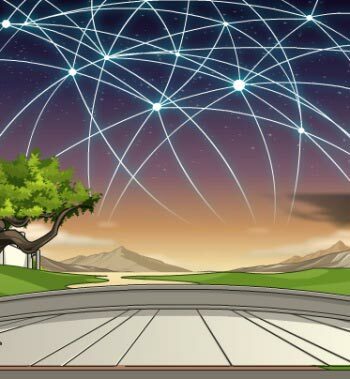 In the Magic Thief event, you'll get a chance to learn about how magic in AQWorlds operates: ley lines, nexuses, and focus stones are all crucial if the mages of Lore are to guide and guard the home they love! Look for a new piece of information on Lore's magic each day until we reach Friday and the event kicks off with a magical BLAST of Chaorrupted insanity! The Magic Thief Cast of Characters! Meet the cast of The Magic Thief series and AQWorlds event! Thieves, mages, and nobility... they fit right in with the rest of the characters in Lore! A talented thief… until he picked the wrong pocket! After attempting to rob the wizard Nevery of his locus magicalicus – what mages on Lore call a focus stone – Conn became his apprentice and began learning the ways of a wizard. Quick of wits and deft of hand, Conn’s past serves him well as he learns the ways of magic! Corrupt and Chaorrupted, the wizard Pettivox is not afraid to get his hands – or his locus magicalicus – dirty if it will bring him power. 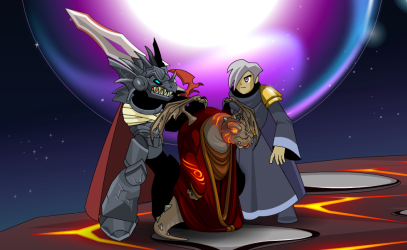 Drakath dupes him into kidnapping many of the most powerful mages on Lore in order to taint ALL magic with Chaos! Smart, sassy, fiercely loyal and independent, Rowan is NOT going to sit and sew while dangers threaten her home and friends. A student at Wellmet’s Academy of Magic, she’s ready to use the resources at her disposal to help her friend Conn save the world! 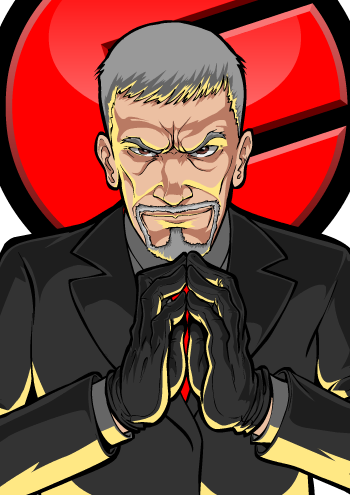 More bodyguard than street-brawler, Benet is the servant of Conn’s teacher, Nevery. He knows his way around Wellmet and prefers baking biscuits to breaking heads. He’ll help you navigate the town when you first arrive… IF you don’t threaten those he protects. Guardian of all who dwell in Wellment, Duchess Willa is strong and determined to safeguard her lands. She’s badly served by her court wizard, Pettivox, who cares more about power than protection. She is ready to help those who wish to keep her people and home safe from harm. Magic on Lore is contained in ley lines, which run across and through the planet like haphazardly-placed latitude and longitude lines. Where these ley lines intersect, there are nexuses of magic which act as reservoirs. There are two central ley lines: the Verix, running North-South, and the Horix, running East-West. To perform feats of magic, a mage must draw on the magic contained in one of Lore's ley lines or nexuses. 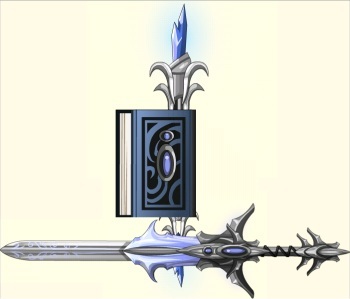 ** All magic lessons will be placed in Arcangrove's magical tome after the event is over. Do ya feel LUK-y, Hero? Gold, games, and green gear galore! It MUST be Lucky Day, and that means the Shamrock Fair is back in town! Join Mog O'Rahilly, Ringo, and all the other Fair-folk for a month* of LUK, leprechauns, and lots and LOTS of loot! Toss your hat into the ring with our newest game - Ring Toss! 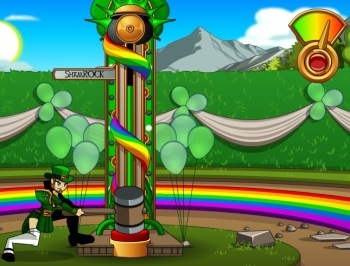 Just head north of the Tower of Strength in the /luck map and you'll meet Ringo, the newest Shamrock Sneevil! If you trust in your LUK, then grab a ring and let'er rip! You could win a bountiful hand of golden tickets! * The Fair will stay in-game until April 13, so get your game on while you can! Lucky Day Rewards and Rares! It's your LUK-y Day, because we've got loads of lucky rares and rewards for you to earn! Talk to Mog O'Rahilly in the /luck map and he'll tell you how to earn these sweet seasonal rares! We'll also have some AC rare-rares, too! The McLuck-iest member-only Lucky Day rewards! Luck o' the Leprechaun Class to ye, me lads and lassies! And we mean, it, too. The Evolved Leprechaun Class is loaded with LUK; you'll be crackin' crits all over the place when you battle baddies with this beastly class! for details on Evolved Leprechaun Class! Some shops leave and some shops stay! 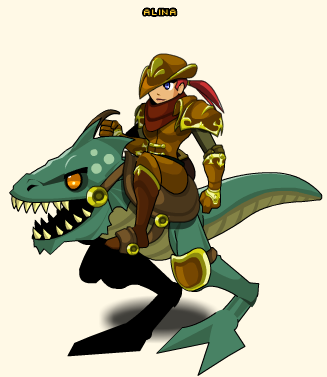 You'll notice the Spring Limited Time Shop and the Australia Day shop have both left Battleon. 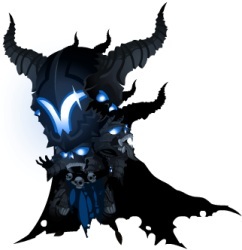 But the Dage Deathday shop is still there, so never fear, Legion fans! If you haven't had a chance to earn the requirements for your favorite rare Legion item, you'll have ONE MORE WEEK in which to get them! 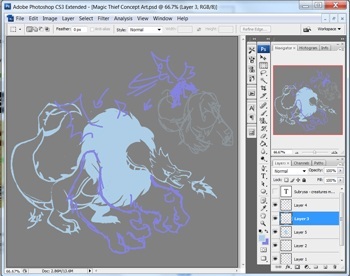 J6, AQW's Lead Artist, has a chance to win a contest go into outerspace. For real, in real life. No joke. And YOU can help send him up there, where he belongs! All you have to do is head to this site and click the button. You can vote once per day, EVERY day until the contest ends. So if you haven't voted yet, get your rocketboosters in gear and go go go! Space. J6 belongs among the stars. Help us send him there! As of this writing, J6 has 14,939 votes, and 99% of that is YOU guys helping to send him there. It's amazing what the power of a community of individuals can do when they band together. Nothing is out of reach, not even the moon! Magic Thief Guest Author Event! Join us for a fantastical AQWorlds in-game special event with magical literary guest-star, Sarah Prineas. Meet magicians, thieves, nobility, and misery-monsters as her characters cause Chaos! She's graciously allowed us to write her characters into an all-new story that takes place on Lore. Meet Pettivox, Bennett, Conn, Rowan, and the Duchess! What will happen when they arrive, you ask? Warlic, Cysero, Conn – a pickpocket turned wizard – and your Hero will discover that the ley lines which contain Lore’s magic are vulnerable to infection by Chaos. When Drakath uses the nefarious wizard, Pettivox, to infect them, it will be up to you and Conn to save all of the magic (and mages) on Lore! These are misery eels. They feed on your sadness. Join us NEXT WEEK for the most magically - and massively - manipulative event yet! Back in July of 2009, we first introduced Dwarfhold and since that time there has been a small nook of just inside the mountain that was once the Dwarven market but had been closed for repairs. Finally, after nearly 3 years of waiting, this week's Mid-Week release gives you the chance to help in the clean-up efforts and open the Dwarven market again! All you have to do (if you have completed the storyline up to this point) is enter the mountain and speak to Hartok Darksoil, Armorer and owner of the "Dwarven Defense" Armor Shop. Or at least the pile of rubble that was once the "Dwarven Defense" Armor Shop. and all the helms and all new Dwarf and Drow hairstyles from Nathrae the Drow Hair Stylist! As I mentioned on Monday, there is no Lore-shattering crisis to solve this week. Just helping to war torn people get back on their feet. Sometimes, that's all you can do and it takes a real hero to do it. J6 Shirts Back In Stock! Just letting you guys know that we got a few more J6 Shirts back in stock in HeroMart! This shirt comes with a Character Page Badge and gives you access to J6's Helm and Outfit. If we are already out of your size, don't worry. This is only the first shipment to come and we will be getting more in stock as soon as they arrive from the printer! Everyone Can Use A Little More Luck! Just a quick Design Notes to let you know what we're working on this week for both the mid-week and the big Friday release. For the mid-week we are finally going to open the Dwarfhold Market! It's been a LONG time since we have visited this area and if you walk to the area pictured above it has ready "Dwarven Market closed pending repairs" for FAR TOO LONG! This Wednesday, you will get the chance to help make those repairs and get the Dwarven market up and running again! No deep and dangerous plots this week. Sometimes a hero just needs to take care of business to either help the people out of a jam or serve their own needs. There's nothing wrong about getting your hands dirty doing a little hard work. It won't be easy but that is why they call it HARD WORK. You will be able to re-open a weapon shop, a dwarven armorer and a hair shop all of which will have new items to sell you (not merge items, just plain old gold shops. Dwarves LOVE them some gold). 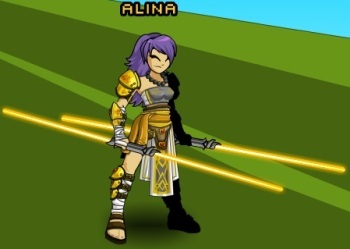 As always, the mid-week and all of the shops and items unlocked are for AQW Members Only! This IS one of the locked areas in the Vath storyline so if you have not yet been to the Pines to visit the Inn-ternet or Donna Charmer the llama farmer, then you will need to do those quests first before you head beneath the mountain. It's almost Lucky Day again and that means that the Shamrock Fair is coming to town! As we do every year we will be adding a brand new fair game to the Shamrock Fair this year, which means another way to earn Golden Tickets to redeem for awesome seasonal rares! AS it is tradition, we will also be adding one or two AC Rares as well that you will never see again. We are also working on the long awaited Evolved Leprechaun Class. 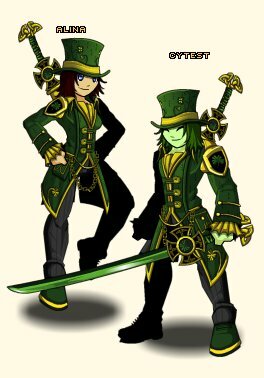 We released Evolved Leprechaun Armor last year (and we will again this year) and the Class will LOOK identical but will operate very differently. 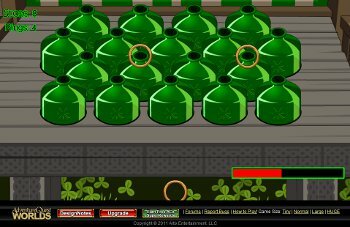 Like the original Leprechaun class this class will also be for everyone, Non-Members and Members alike,. Please note that this class will be a SEASONAL RARE, it will return every Lucky Day. 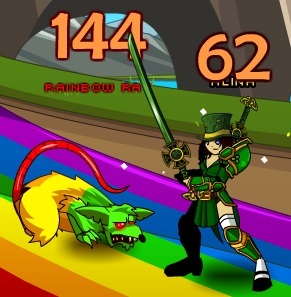 I will tell you guys a lot more about this class when I do the Skill Breakdown a little later this week but Evolved Leprechaun is a CRIT based class with lots of skills to buff your Crit CHANCE, as well as some all new skills which will raise your Crit DAMAGE. Rather than doing double damage, your crits might do triple or even quadruple damage and you will be criting often. It's based on the original class to some degree but each skill is new designed just for this new class. It will work best with LUCK Enh (as it should) and like all modern classes it will have a rank 10 passive. So, get out your shamrocks, green shirts, horse shoes, rabbit's feet (Ampy, run for yo life) and lucky pennies! It's time to go to the fair! 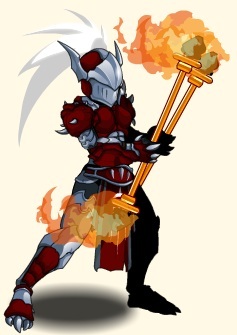 The Insane Pyromancer Returns to AQW! 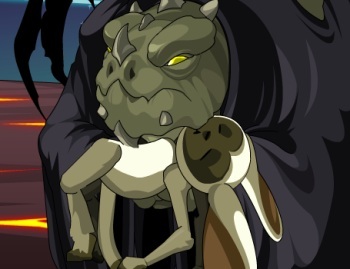 One of the AE Community's favorite villains returns to AQW this week. XAN is back! 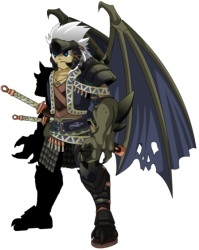 If you have never played Dragonfable then you might not know who this guy is. I suggest you talk to Warlic at the top of the volcano map. He can fill you in on some backstory. If you missed out on the first Xan release then you will need to make your way to the top of the volcano before continuing into the town of Basani which Xan has attacked. The parents of Basani have been separated from their children and now their burning town swarming with fire monsters and the insane pyromancer himself separate them from each other. You will need to take a little extra care in Basani as the monsters will attack you on sight! Be prepared to rest between spawns before you get to face Xan himself. Fighting fire with fire using the new Elemental Dracomancer class! 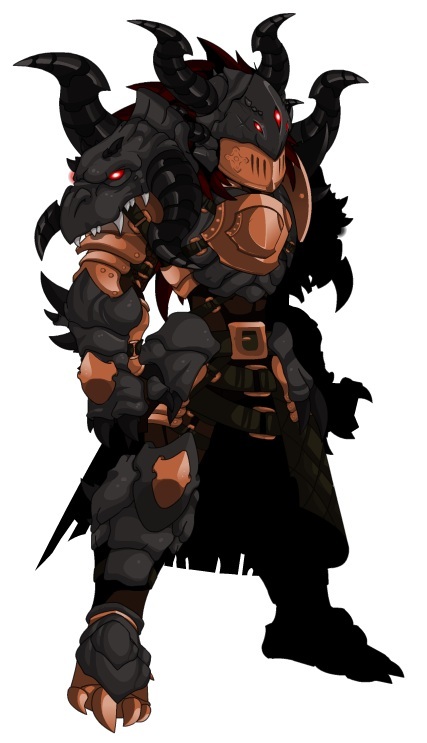 You will be able to get the same monster drops from the Volcano or farm Xan for a bunch of brand new Member and non-member gear, such as the Molten Dragon Set! It's been a while since we've seen Xan but hopefully we won't wait so long next time before we continue his story. Daylight Savings Time is coming up on Sunday. That is when we (well, some of us) turn our clocks ahead one hour (and lose an hour of sleep). To celebrate we will be having a Limited Time Shop (Button in Battleon) where you will be able to get some really nice spring themed rares all crafted by Solrac! SPRING into action before the clock counts down to 0! Remember, you can get more Treasure Chest Keys from Twilly in Battleon, or just sell the unopened chests for a little extra gold if you don't want to see what is inside! 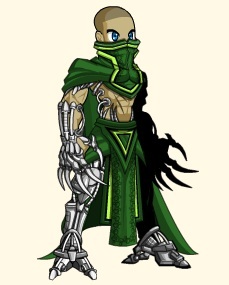 Following close on the heels of Dage's Birthday Shop, Dage has decided to update his Legion Shop in Shadowfall with new items! 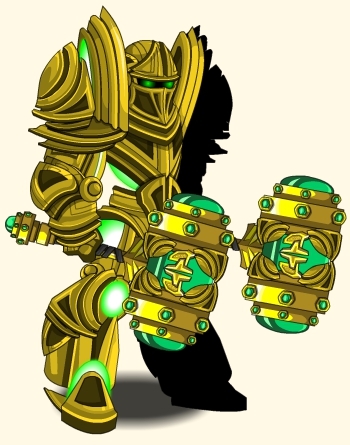 Legion Titan (armor) which will cost you 1 Undead Legend Armor and 1 Essence of the Undead Legend. Legion Titan Crown which will cost you 200 Legion Tokens and 1 Undead Legend Crown. Legion Titan Cloak which will only cost you 150 Legion Token. 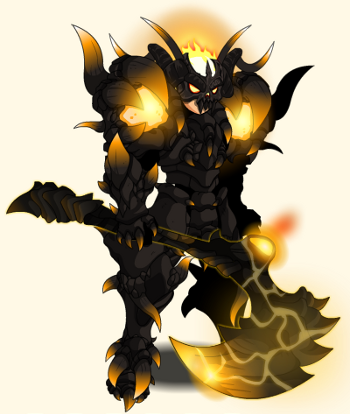 And speaking of Dage's Birthday Shop we have a LOT of Legionaries who are saying that they would like to see Dage stay in Battleon and celebrate his deathday for a little while longer so we've extended the shop just for you. It will be here until next Friday unless there is another round of demands to extend it. That is one long birthday party! I CAN HAS MOD - Final Round! The semi-disastrous I CAN HAS MOD contest has now begun its last round. 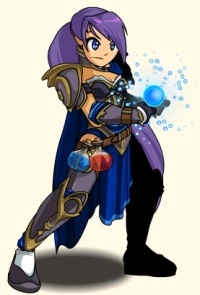 You can pick up the Last Cheezburger Deluxe from Cleric Joy in Battleon to get 1 CHANCE to win but remember that you get 1 EXTRA CHANCE to win for every month of Membership you have left on your account at the time of the drawing and 1 EXTRA CHANCE for every AExtra that you complete. The drawing will be held on March 30th. We will then try to contact the winner and get their wish. Make sure that your AQW e-mail is an ACTIVE one that you check often. Or at least on the 31st. #2: In the event that a wish will break fundamental game play, upset a player or group of players, or in any way result in problems or complications for the staff or game... a Genie Lawyer will be summoned from the forbidden plane of litigious wishes. If the wish was made with good intentions, the Genie will begin to negotiate a wish that will benefit the wish maker. If the wish was made out of spite, hate, greed or bad intentions, the Genie is allowed to use their powers of “wish legalese” to re-interpret the wish. If the genie is “unclear” on a certain part of the wish… even if it makes perfect sense to everyone else, the Genie is allowed to ask random players online questions and replace parts of the original wish with their answer. #3: Any wish for an item will turn ALL Golden Cheezburgers in the game into the item that was wished for. #5: If a wish is made for something that does not exist, it will be created as long as it is original. If it is a selfless wish, it will be created with love and care. If it is a greedy or hurtful wish, another randomly selected player will be chosen to make a counter wish, which may produce unexpected and unfortunately results upon the original wisher. #9: Any wish that requires a lot of coding and might break the AQW programming team or make said team cry (i.e. Class, Entire Zone, All New Functionality) can only be wished for once per calendar year. Once that item has been wished for another items in this category cannot be wished for again until one year from the granting of the previous wish as elapsed. #10: Unknown, and oh man, this one is 100% insane. Please never unlock it. Remember that each of these rules can only be unlocked by people using wishes that attempt to break that unseen rule. Once again, the reason that we're closing the contest down is that the last wish met with an insane amount of complaints even before the wish came out about receiving several completely free gifts. It's building unrealistic expectations, seems to bring out the worst in the community and takes up a lot of our time and resources. It's simply not worth running it again after this. The contest may arise again in some other form with new limitations and restrictions, but then again it may not. To those of you who have kept a positive attitude, thank you. We have been REALLY lucky so far and gotten several kind, selfless and very thoughtful winners and I can only hope that this last one is just as great as the others have been. AE enters the third dimension! 3D gaming is about to get Artixized! (Yeah, it's a verb now.) 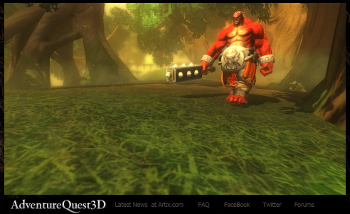 If you haven't heard the news yet, Artix Entertainment has begun work on a brand new 3D MMO! We're all very excited about this game, and hope you guys will be, too! 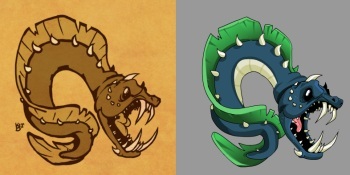 The AQ3D team has both male and female models, a monster, and the forest modeled and textured. Next up: the first dungeon! Better stock up heal potions for THIS dungeon! I know I want to Battle On through this gorgeous forest! To see all the behind-the-scenes previews and sneak peeks of production before the game goes live, head to Artix.com, where Artix is blogging about the team's work on our newest, unnamed game. Join us as we begin the most challenging quest in AE history - battling through a whole new dimension in videogaming! * We already had someone try to take Dage's name. Plot foiled by Zhoom's mighty code-skills. ** And if you've already pre-registered but want to change your name, then now's the time! Name changes are free during pre-registration! What Goes Into a Release? Chaos isn't just a part of the game! The map for Cysero's Xan release this Friday! 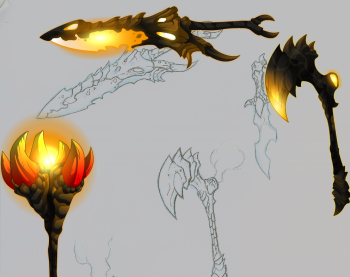 Dage keeps on making more release art, work on art for future projects. Write intro/outro text for the NPCs pop-up boxes. Work on special projects: plan upcoming events and holidays, fit them into the 2012 schedule. Review new in-game music. Mid-week member-only release day! The Chaos starts early and ends late. Begin cutscene animation. /samba /samba /samba! Don't drop these weapons like they're hot. More art! Finishing armors, moving onto weapons, sketching concepts for future pieces. It's Friday, it's Friday, gotta release on Friday! Everybody's looking forward to the weekend, weekend. /Party'ing /Party'ing, dodge! /Party'ing /Party'ing, CRIT! Fun fun fun fun, gaming through the entire weekend. ALL HANDS ON DECK! Fridays are a mix of silence, focus, and intense effort at high speed. A flood of items get put into the database, items, quests and cutscenes get tested, Samba goes into the zone and knocks out the final cutscenes. Design Notes and homepage updates get written. As the day wears into the afternoon and it becomes clear that the release IS going to happen, the team gets looser, relaxs, and the jokes start to flow... until about 5pm. Then things kick up into high gear again until, in a frenzy of testing and re-testing, fixing and re-fixing, the release is made live. Keeping track of feedback, making announcements, and interacting with players happens throughout the day Monday through Friday. It's an important part of the job; we need to know what you like and don't so that we can design future releases. Planning meetings with the other game leads, meetings with individual AQW team members about side and future projects, marketing and business meetings... They're vital to improving maintaining AQWorlds (and there are a LOT of them), but they do take time away from making the release for you guys. Building up excitement for new releases is a big part of the week. We're always excited about what we're doing, and want you to be, too! The database is where ALL of the information about your character, inventory, factions and achievements are stored. It also has a list of ALL the items in-game. And every new item needs to be put into the database. And every piece of art you see needs to be uploaded onto the servers. If that doesn't happen, maps don't load. It's an important step. Get AWESOME swag from amazing players across the world! Make sure you don't grab the wrong soft drink! Star in videos (have you seen the one where we're all zombies singing Happy Birthday?). 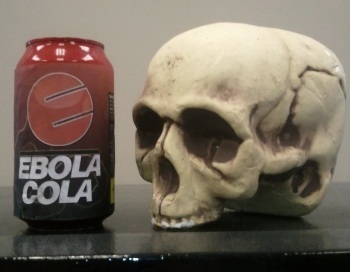 Discover EbilCorp ninjas have infiltrated the Lab, spend the day locking up valuable items. 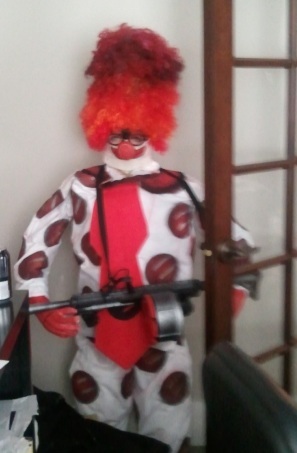 Hope the Creepy Clown isn't moved into your office. This was moved into the artists' room. Luckily, it hasn't moved again. But then we get awesome surprises - guests visiting the lab, awesome swag from Australia or Japan, shipments of new HeroMart items to check out... seems like no day is ever the same! This is a VERY brief look at some of the things we do during the week. Listing all of them would triple the length of the Design Notes, and we want to avoid that. But you asked for a sample of what goes into a typical AQW release, and this is that. Making videogames is a lot different from playing videogames. So much of what makes the release happen is never visible on your monitor, but without the coffee, crits, and carpal tunnel that goes into them, it'd be all Chaos and no-one Battling On! * Future videogame designers: it can be a lot more fun than the following list sounds... most of the time. But it's also a lot more work than many people think. It's good to know what you're getting into before you jump into a new career. AQ3D Name Camping Is OPEN! 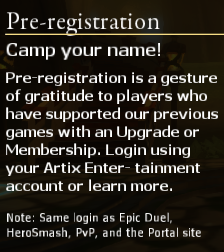 If you were not aware, you can now go to ARTIX.COM and pre-registern your character name for our next big game which is now called AQ3D! You need a few things if you want to grab YOUR character name before anyone else! You need to have supported any AE game by PURCHASING SOMETHING. You need to have that game account tied to your AE MASTER ACCOUNT! Note that the intro fly-through is done in the game engine and what you're looking at will be very close to what the game itself looks like when it's ready for launch! CAMP YOUR AQ3D NAME NOW! The Long Awaited (But Not Nearly Long Awaited As Grenadier Was) Etherstorm Class Arrives Tomorrow! Before I say anything else about this class, I'd like to mention that THIS IS NOT the Dracomancer Class from AQ Classic. If that's what you're expecting, look elsewhere. 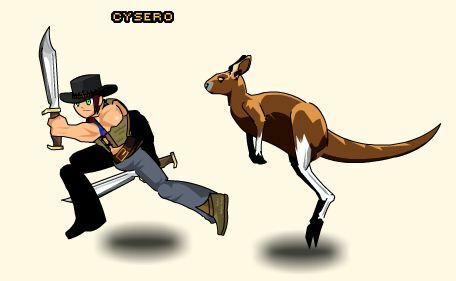 AQW is a different game with different art and different artists. Sometimes (like with the Battle Tested Axe Master armor) we strive to get as close as we can to the original but this is NOT one of those times. This is the ELEMENTAL DRACOMANCER! Like all Dracomancers, it is bound in spirit and power to the ancient dragon race, but unlike standard Dracomancers, it is also tied to the four new Elemental Prime Dragons of Fire, Water, Earth and Wind. We've done a few new things with and for this class. First, you are able to click on the HEAD, FOREARMS and CHEST STRAPS of the class and each will set on a transformation bringing you closer and closer to dragonkind. Click the Head: Your face alters and transforms into the head of a dragon! Its skin color is the same as your own and it's lower jaw will match your eye color. It looks a little funny with some of the hairs which stay loaded but we had to add it. Click the Forearms: Your hands transform into deadly dragon claws! Click the Chest Straps and you will sprout color custom dragon wings from your back. These will load on top of whatever back item you have but will not replace it so keep that in mind. Next, we added some special skill animations for this class. The coolest of which is the fire breath animation! A Dracomancer is a caster class, built on the mage mana regen which regains mana based on hits and crits and varied depending on your current HP. Like most caster classes you will want to load up on WIZARD Enhancements to get the most bang for your gold. This class is REALLY straightforward. It is designed to be a solo class, with good survivability and a LOT of damage potential but no self-heal at all. But that's what potions are for. Whack. Whack. Whack. Whack. Whack. Whack. Whack. Breathes fire on your target causing moderate and applying the DragonBurn state to them for Damage Over Time. 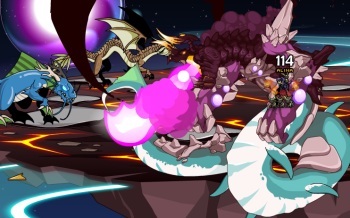 Yup, that's me puking a fountain of flame onto Wolfwing in testing. The animation makes this really fun to use but it's a pretty basic attack. Initial blast of flame causes moderate damage, DoT causes more. VERY short cooldown. Summon the Water Prime's power and hit your foe with a crushing jet of water which has a slight chance to stun your target. This is another fairly basic attack with a new animation. It does half again as much damage as the last power with a slightly longer cooldown and has a chance to stun your target. Since it's not something you can count on, it's more of a nice bonus when it does happen. Gathers mana from nearby ley lines and increases your damage resistance by 70% for 6 seconds. This is where things get interesting. Notice that the mana cost is not 30 mana, it's -30 mana. You RECEIEVE mana for using this skill. It doesn't do any damage at all but it provides 75% Damage reduction! Dragon's scales are the stuff of legend. They are able to withstand the worst punishment imaginable and for 6 seconds... so can you. You will want to use this a LOT. There's no reason not to. It feeds you mana and makes you touch as nails! If you spam it every 12 seconds, then half the time you're fighting, you are only taking a quarter damage, even if you're stunned or petrified. Very fitting passives here. You get a passive INT buff which means more damage for you AND you can dish it out faster. You gain the speed of a flying dragon, causing moderate damage to your target. This power also DOUBLES your attack speed and cuts all mana costs in half for 8 seconds. Another decent damage ability, but the buff is really what you want here. By doubling your haste and halving your mana cost, you are attacking at 2x speed but still using the same mana as you would if you were attacking normally. It's a little costly but this is one class where mana management is NOT a problem. This class we DESIGNED so that at rank 10, you CAN click all the powers as fast as they pop. In fact, you SHOULD. With no heals, your only recourse is powering through enemies as fast as you can. I even recommend using the number keys instead of clicking the powers. Rarely, you get in touch with the united power of Desoloth and ALL of your attacks are crits for a short time. You can't embrace the Primals without accepting that Desoloth is also an elemental dragon. You get in touch with the source of his nearly limitless power and EVERYTHING you do for a short time is a critical success. Let's look at the entire class, as a whole. No heals, great defenses and AMAZING potential for carnage. This class requires no finesse AT ALL. You don't need to watch your life unless you have potions to heal you. You don't need to watch your mana unless you are just amazingly bad at this class. There are no multis to concern you with when you should use a certain power. This class was not designed as a mutli-purpose or PvP class like Grenadier. It was not designed for farmers like Darkside. This was designed with the solo player in mind. 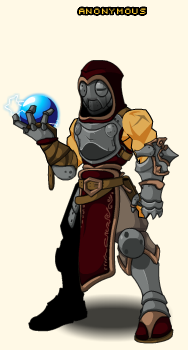 Tomorrow you will be able to get this class from any of the Dravix Priests in Etherstorm in the Etherstorm Rep Shop or you can get it from Itzachi (along with the Member Only Skyguard Grenadier) in Battleon for 2000 ACs. Tomorrow also marks the start of the Etherstorm War against (or for) Desoloth, the arrival of the Australia Day NPC and items wished for by the last ICHM winner and Dage The Evil's Birthday with lots of Dage-made goodies.